Your birthday child will become our Hero of Honor for the day! 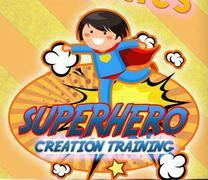 Guests will go through a series of Superhero training exercises to help them all become true Superheroes! When the Heroes in training complete the Training Camp, they will receive a Superhero Mask. The Hero of Honor also receives their very own Superhero Cape!